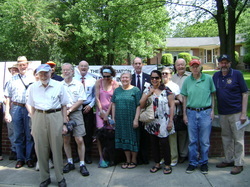 World War I 16th Street Tree Memorial - The Association of the Oldest Inhabitants of D.C.
Twenty-eight AOI members, neighbors and dignitaries joined together at 16th & Alaska Avenue, NW on Memorial Day 2010 to commemorate the 1920 dedication of the District's World War I 16th Street Tree Memorial (not to be confused with the DC War Memorial in Ash Grove on the Mall). DC Councilman Phil Mendelson read the Ceremonial Resolution that he introduced and was passed by the DC Council on May 4, 2010, recognizing the 90th Anniversary of the memorial's dedication and calling upon stakeholders to rededicate the memorial on its centennial, May 31, 2020. AOI is calling for the placement of appropriate commemorative waysides (informational markers) at both 16th & Alaska Avenue and at 16th & Varnum St (the southern most point of the 2.3 mile long memorial) in time for the 2020 centennial of the memorial. To read the DC Council's Ceremonial Resolution, click here: DC Council Ceremonial Resolution. To view the AOI's on-going compilation of the District's War Dead who appear on the DC War Memorial and are remembered in the WWI 16th Street Tree Memorial, you may do so here: District of Columbia War Dead 1917-1918. Please email any corrections, additions or question to us at aoiofdc@gmail.com. "Thank You!" to Elizabeth Foxwell Editor, "In Their Own Words: American Women in World War I" (2015) http://elizabethfoxwell.com/WWI_Anthology.html for corrections she provided to our listing. On Dec. 21, 2011 long-time AOI member Lee Rogers died suddenly after a brief illness. Lee was the inspiration behind the AOI commemorating the 90th anniversary of the 16th Street Tree Memorial and had hoped to continue his research together with that of historian C.R. Gibbs to research the individual stories of the 499 District men and women who perished in service to their country. Now, Lee will not be a part of that initiative. The AOI hopes to work with DC Council Member Phil Graham, Ward 4 Council Member Muriel Bowser, the ANC, local neighborhoods, the DC Office of Historic Preservation, the Casey Tree Foundation, the American Legion, the VFW, the National Park Service and others to rehabilitate the stretch of 16th Street with new tree plantings and interpretive waysides in time for the memorial's centennial in 2020.